The first test flight of a privately built robot space capsule to the International Space Station has been delayed to allow more time to prepare the vehicle, the spacecraft's builder announced today (Jan. 16). 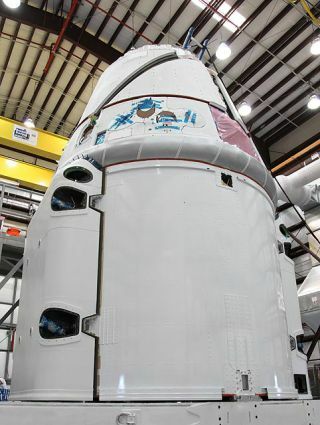 The unmanned Dragon space capsule, built by the California-based Space Exploration Technologies (SpaceX), was scheduled to launch toward the space station on Feb. 7, but the company has decided to postpone the flight to accommodate more engineering tests. "In preparation for the upcoming launch, SpaceX continues to conduct extensive testing and analysis," SpaceX spokesperson Kirstin Grantham said in an email statement. "We believe that there are a few areas that will benefit from additional work and will optimize the safety and success of this mission." A new launch date for the mission has not yet been announced, but SpaceX officials said the company is working with NASA to determine the best time for the test flight. The launch of the Dragon capsule atop SpaceX's own Falcon 9 rocket is expected to be a critical step for the private spaceflight industry. The mission is designed to test the vehicle's ability to carry cargo to the station, and if successful, Dragon will be the first commercial spacecraft to rendezvous and dock to the orbiting outpost. During the flight, the capsule will rendezvous with the complex, and members of the space station crew will grab the vehicle using the station's robotic arm and attach it to the Earth-facing side of the outpost's Harmony node. This process is similar to how visiting robotic Japanese cargo freighters are grappled and attached to the space station. SpaceX's planned flight is the second for the company under NASA's Commercial Orbital Transportation Services (COTS) program. While this mission will test the Dragon capsule's ability to rendezvous and dock to the space station, SpaceX is eventually planning to use a version of the vehicle to one day carry NASA astronauts and other paying customers to low-Earth orbit. Last month, when NASA announced the original launch date, William Gerstenmaier, NASA's associate administrator for the Human Exploration and Operations Mission Directorate, said that SpaceX would need to satisfy all of the agency's safety requirements before being allowed to perform the demonstration flight. The Dragon capsule launched on its maiden flight in December 2010 in what was SpaceX's first test flight of the robotic vehicle. The spacecraft completed two orbits of Earth before splashing down in the Pacific Ocean. The historic mission marked the first time a commercial company launched and returned a capsule from space. With the retirement of NASA's space shuttle program, several commercial companies are vying to fill the cargo-carrying void left by the grounded shuttles. NASA's COTS program is designed to foster the development of a new fleet of private spaceships that will deliver food, supplies and hardware to the space station. As part of its partnership with NASA, SpaceX will receive up to $396 million for the successful completion of the milestones outlined in their Space Act Agreement. Orbital Sciences Corp is another private company developing a cargo freighter under NASA's COTS program. The company, based in Dulles, Va., is building its Cygnus spacecraft to carry supplies to the space station. Orbital will receive up to $288 million for the successful completion of their planned milestones, with the first Cygnus test flight expected in 2012.